There is so much to see and do in Chiang Mai but, no trip is complete if you don’t go discovering North Thailand Mountains. Take a day trip from Chiang Mai and visit Doi Inthanon. At 8415 feet tall, this is the highest point in Thailand. That’s what we did. We knew in advance that our trip to North Thailand should include Doi Inthanon, known in the past as Doi Luang (big mountain). The actual name was given to honour King Inthawichayanon, one of the last kings of Chiang Mai. He was very concerned about nature and tries to preserve all the forests in the North of Thailand. When he died the remains were placed at Doi Luang and the mountain renamed to Doi Inthanon. The park covers so much area and it’s a destination for both foreign and Thai tourists. The park has varied climatic and ecological areas regions so, its home to a diverse range of animal species, including over 360 bird species. You can find also The Inthanon Royal Project Research Station, King Bhumibol Adulyadej created the agricultural station to help eliminated opium cultivation. This contains greenhouses for growing ferns, a rhododendron garden, and flowering plants and vegetables. 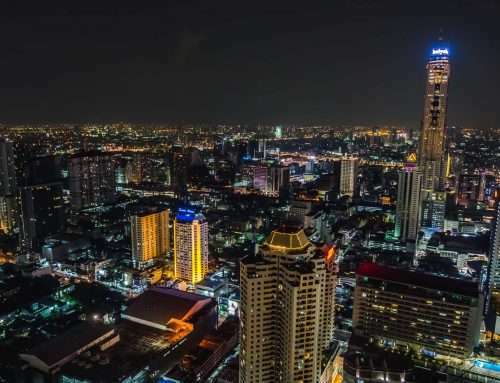 If you are visiting Thailand don't miss the 12 best cities to visit in this amazing country. When we first think on a day trip from Chiang Mai to Doi Inthanon we want something quick and efficient because we didn’t have much time to spend in here. At first we did some research and in the end, we choose a company named Blugecko to do the tour. With our Thai sim card, we have internet everywhere in Thailand so it's easy to do some research online during our trips. Bluegecko is a local company offering a full range of exciting day tours from Chiang Mai. They also provide custom made tours, travel services, and even bus or boat service to Laos. We choose this company because they are concerned about nature, they even have eco and community-based tourism tours. They are very professional, always on time and always trying to do the best they can for you to have the best experience of their tours. We recommend them if you want someone competent, reliable and honest in this kind of service. Of course, if you are going on a tour you haven't scheduled to visit everything and also don’t expect to go to every single site for example. So, it isn’t a flexible option but, Blugecko has lots of itineraries to choose from. Or even if you didn’t find any that suits you, just customize the tour. We started our day trip from Chiang Mai hotel, where the company picks us in the hotel lobby. They were very punctual so, at the hour we marked they were there. On this full day tour, Blugecko provides us an air-con van with a driver and a tour guide, both speaking good English. Our guide Toi, had a license approved by the Tourism Authority of Thailand. Our driver name was Nicky. We then went picking another people from hotels and when we were all together, Toi gives us a brief of the program for the day. A day trip from Chiang Mai to Doi Inthanon is approximately 1h. We had the time to know each other and also for our guide tell us about the story of Chiang Mai and Doi Inthanon. Thai people are very proud of their past, they have an immense history and they are for sure one of the greatest cultures in Southeast Asia. Doi Inthanon is surrounded by many waterfalls. One of the most visited is a dual stream waterfall, named Wachirathan. We did go to this one. It is easily reached by a parking lot and we only had to walk some steps to actually being on the waterfall site. When we visited we walk to stairs until reaching a wooden platform to snap a good picture. This is a powerfull waterfall; you will be wet at the end of the visit, even if you have raincoats as we did. After the waterfall, we continue our trip to reach Doi Inthanon. The road was well signalized but, the driver had to be carefull special because the street was all wet. We had to remember we were going up the mountain so, it takes time. This place is rich in things to see and do. It is almost impossible to get bored unless you don’t like nature. For nature lovers, like us, Doi Inthanon National Park is a must go place. Doi Inthanon is also a good place if you are searching for a day trip from Chiang Mai, because it isn't so far way from the city. We had known previously that, here we can find waterfalls, temples, hiking trails, camping sites, local markets, food stalls, the National Astrology Observatory and much more. The park is huge, so we did some research to know better the entire trajectory. If you are heading on a day trip from Chiang Mai to Doi Inthanon, this place should be on your list. Located approximately 2565 meters above sea level, this is the so-called ‘The Roof of Thailand’. The whole path is signalized so, we find a massive sign with the exact location; don’t forget to take a picture. We did of course! There is also a trail around this spot, very well paved, through some shaded parts of the forest. We actually didn’t have luck, it was cold and a little bit of raining in the day we went there, so we wanted to finish as quickly as we can. You will see many small Buddhist shrines. In one of them, we threw a coin and asked for a wish, if the coin fell in the center, our wish will come true. We didn’t have luck. All trail should take you approximately 15/20 minutes to finish, like us. At the end of the trail, we will see a little coffee shop and some souvenir shop. We recommend drinking something hot. When it is cold weather and raining it gives you strength to continue. We just took a few minutes to drink our hot coffee surrounded by nature, as we love. Then, we kept on going until the next spot the Angkha Nature Trail. Angkha Nature trail is just one of the many trails you can do at Doi Inthanon. It was raining but, we actually did this trail that looks like a creepy forest all over the path. The little trek it is only 360 meters long, so nice to do if you don’t have much time to spend. Angkha Trail it is entirely on a broardwalk, with scenic views that take you through the beautiful cloud forest and some patches of rare swamp forest. It takes us 20-30 minutes to walk and it is an easy flat trail, only a few meters to the end wore sloped. This is a magical place, home to some of highest forest and watershed in Thailand and some of the largest species of the moss in the world. This trail was designed to people enjoy nature but, cause less impact in the vegetation around. We love it! Sustainable and eco-tourism all the way! After this trail, we finally get the chance to see the Royal Pagodas and the surrounding gardens at the Doi Inthanon. It is easy to access this place, there’s a parking lot were everyone should leave the vehicle. From there you just have to walk a few meters until reaching the entrance to the Pagodas and the garden. The Doi Inthanon Royal Pagodas were built to honor 60th birthday anniversary of King Bhumibol Adulyadej and Queen Sirikit. The Twin Pagodas sit on opposite peaks, facing each other and share the same design. The King Pagoda is the biggest one and has a dark grey colour, the Queen Pagoda is the purple one; they are surrounded by beautiful gardens. One curiosity about the two Pagodas is that they are known as Phra Mahathat Naphamethanidon meaning “by the strength of the land and air” and Phra Mahathat Naphaphonphumisiri meaning “being the strength of the air and the grace of the land”. The gardens are lovely, very well maintained, with so many colourfull flowers, butterflies and bees. You can sit on the many benches around and relax as we did it. Or simply, enjoy one of the most breath-taking views of Thailand, it’s absolutely stunning, but only if the weather permitted. They are located at 2100 meters and have access from a wide paved road, except the last 10 km. You can reach the top of the Twin Pagodas by escalator or the stairs. We started our visit going up until reaching the King Pagoda, the largest one, with a grey colour. Inside you can see a Buddha statue, the walls and ceiling are decorated with panels of important events in Buddhism. In the exterior, the artwork continues to flow. The Queen Pagoda is the purple one and actually smaller. Again, inside you can see shrines, with Buddha images. It’s also possible to see lovely panels of artwork. When we finish our visit to the Royal Pagodas it was time for eating but, on our way to the restaurant, we made a quick stop on the market. We love local markets, it is a good opportunity to buy fresh things and help local communities. But, sometimes this type of tours forces us, tourists, to go to these places only to buy. We really don’t like that kind of propose. To be completely honest, we like to go, talk with the local people, and know more about their lives and the products that they sell. We always end up buying something we like but, this is a complete experience. You buy because you want, not because someone is forcing it. As soon as we arrived we try to get the best of this, some we end up talking to some local people. Most of them sell in the local market products that they have, this is the only way to sustain the family, so it very important to sell to tourists. From delicious fresh fruits, dried fruits to veggies, you will find everything here. There were also, 2 or 3 stalls that sell clothes and jewellery. We end up buying some ‘cajus’ in a little bag, too bad it was plastic. We love dried fruits so we end up eating all before arriving at the restaurant. Located on the side road, we ate delicious Thai food. After we eating, we just had a few time to socialize. Then, we head back on the road but, not for long. A few meters away from the side road restaurant, it was located the entrance to our 2h trekking. We just can't complete a day trip from Chiang Mai without doing any trekking throught the dense forest of the Doi Inthanon National Park. Ban Mae Klang Luang standing on the hilly rice terrace is divided into 4 villages that comprise around 60 - 80 families each. This place became the settlement region of Pga-gan Yaw, a Karenic tribe from Burma. The local people dedicated their lives to work on the land, mostly in rice fields but, also they cultivated coffee. You can reach the village by trekking through the dense forest or by car. Of course, we think it is more exciting to walk on your feet and see all the beautiful scenery around you. If you want to do the trail until reaching the village you must go with a local guide. This is mandatory, you have to pay him some fee to guide you through the forest. We actually don't know the real price, because as we going on a tour everything was included. A few minutes on the path and we realized how much the guide was needed. The trekking was absolutely stunning, deep inside the heart of the forest, in the silence of nature, with jaw opening landscaping. Trust us when we say that you will never see anything like this. If you love nature like we do and enjoy peaceful moments you must do this trekking. In one part of the trail, there was a little waterfall, we had to cross the river through a little bamboo bridge. A few meters away we had reached a big rice terrace. One other rule to do this tour is, no trash dropping or plants teasing. Keep in mind you should wear appropriated clothes and walking shoes. Some of our colleagues on the tour had difficulty because of this so, don't risk your life. Also, bring some water with you because in some parts of the trail you don't have many shades. When we finally reached the village we were very surprised. The view is breathtaking, the little village has some bamboo houses very unique. But, the most surprising thing was a little church in the middle of the village. We never thought to find this in a village in the mountains in Thailand. After the trail we need to relax a bit so, nothing better them a natural coffee. This is produced in the village, the coffee shop house was a very rustic wooden pavilion. The coffee is fresh, using some rural way to process them, not the modern coffee machine we all use at home. All the coffee produced here is from Robusta species. In our home country, we consume more from Arabica species but, the coffee from Ban Mae Klang Luang village was good. In the rainy season, the village of Ban Mae Klang Luang is magnificently covered by a thin layer of fog and the rice terraces have a beautiful green colour. This is a fantastic time to visit and appreciated the views. From late October to early November, the entire area is brightened by golden ears of rice. We visited in November, although the weather at Doi Inthanon wasn't good, in the afternoon the sun came out a little bit and it was warm when we did the trail. Before we go on a day trip from Chiang Mai to Doi Inthanon we did a quick research and gather some information and usefull tips. It's always important to be prepared for this kind of trip. Use warm clothes: we recommend taking a jacket or a light jumper and long trousers if you are going on a tour. Inside the van its good, but when you step outside it will be cold. If you are doing by yourself, driving a motorbike consider taking a puff jacket, gloves, and long trousers. Right shoes: This is very important, bring comfortable walking shoes. If you are going to do some of the trails you need appropriated shoes. But, even if you don’t want to do a trail bring nice shoes. We knew how this works so we did bring the right shoes but, in one of the trails we end up helping two girls because they didn’t bring walking shoes and almost fell from a canyon. Food and drinks: You don’t need to take lots of food with you. The most important thing is actually a bottle of water because the food you can find almost everywhere. It’s a good idea to buy some fresh fruits in the local market. If you are going on tour, they actually give you a bottle of water and the restaurant is included in the tour package. Bring cash: Of course, if you are going to the mountain there is no ATM there. So, bring along some cash with you. Only the necessary to buy some food and something you need. Start early: Although the park is huge, we recommend going early if you want to make the most of your day. We think the place most crowded is the Royal Pagodas, but we still managed to enjoy everything. The park opens at 6:00 am and closes a little bit early at 4:30 pm. Solar protection/Mosquito repellent: The park has lots of shades so you probably don’t need solar protection. But, bring it anyway, because in some trails you probably need it. We actually end up not using, but only because we had already tan and the trails we did had well shaded. You absolutely can’t skip mosquito repellent. Always remember you are in contact with nature so, expect lots and lots of mosquitos. In altitude you normally don’t see mosquito but, if you are going on trails they are there too. Sandrina has a big problem with these fellas so, we always need tons of mosquitos repellent. Bathrooms: Don’t worry if you have a tiny bladder, there are lots of bathrooms along the park. Just search for the signs. Luckily we don’t have issues so, we end up not needing the bathroom. Entrance fee: If you are going on tour like we did the entrance fee is included in the package. In other cases, the Doi Inthanon entrance fee is 300 Baht for an adult and 200 Baht (6 USD/5€) for a child. If you have a motorbike, there will be 20 Baht (0.60 USD/0.50€) fee. An additional fee of 40 Baht (1 USD/1€)needs to be paid to see the pagodas. Chiang Mai is a must go place if you are going to the North of Thailand. There are some many things to do here, as the day trip to Doi Inthanon. But, if you want a real experience in contact with amazing creatures you need to spend one day at an Ethical Elephant Sanctuary. Adoramos Chiang Mai. Excelente post, muito boa a forma como expõem a vossa história. Obrigado :) Chiang Mai foi sem dúvida marcante. Thanks for sharing, such a great post and such a great place! As usually the less known places are the best ones! Thank you. So true…the less known places are always surprising. De certeza que vao gostar quando forem. É um país muito rico cuturalmente muito tradicional e cm muita história. I haven’t yet been to Thailand, so I loved to read your adventure in Chiang Mai. Thanks for sharing all the details. Have you been to Myanmar? It’s a fantastic place as well :) Safe trips! Thank you :) We haven’t been to Myanmar this time but, we really want to go. We heard a lot of the country but, mainly it’s genuine so, we are curious about it. De certeza que vais adorar. É um país com muita historia e muito rico culturalmente. A Tailândia é aquele país para voltar :D voltem e visitem o Norte, vao adorar..é menos turístico e muitas vezes, nas pequenas vilas mais rurais onde se encontra a verdadeira essencia da Tailândia. Adoro a vossa maneira de descrever os locais! um artigo fantástico que me deixou com vontade de voltar à Tailândia.